When in San Franciso, one must head over to Boudin at the Fisherman’s Wharf to try their signature sourdough bread. Sourdough is created when yeast settles into the bread dough and covert the carbohydrates into lactic acid and other acids that gives it the sour flavor. The uniqueness of this sourdough bread is due to the original “Mother dough” culture from 1849. So precious is this “Mother dough” that it is kept under lock and key in a fire-proof safe. So how does it taste? 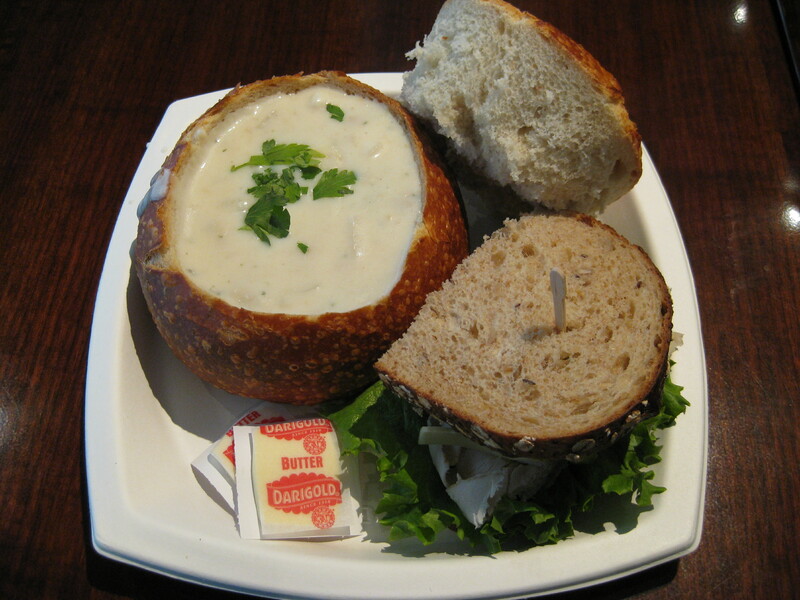 I ordered the sourdough bread bowl with clam chowder. The sourdough bread has a nice tang to it and was springy to the bite. The crust was chewy without being too tough. I could taste the freshness of the clams in the chowder and they complemented each other beautifully. The King Cake is believed to have originated in France around the 12th century. It was made to celebrate the three wise men bearing gifts twelve days after Christmas calling it the feast of the Ephiphany or Twelfth Night. In Louisiana, Twelfth Night also signifies the begining of carnival season which ends on Mardi Gras Day/Fat Tuesday. During carnival season, King Cakes are eaten. Hidden in each King Cake is a plastic baby signifying the Christ Child. 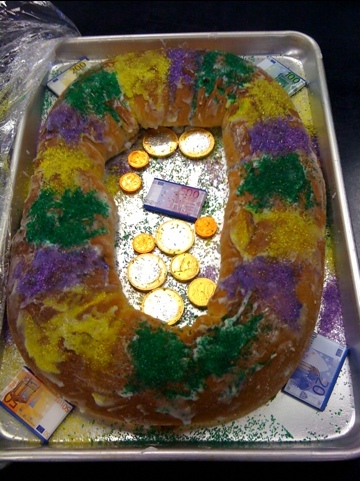 The person who receives the baby in his/her portion is considered very lucky and has to buy the next King Cake. In Louisiana, the 3 colors of Purple, Green and Gold are official Mardi Gras colors representing justice, faith and power. This King Cake made by my colleague’s wife has the texture of soft and chewy brioche bread. It has cinnamon filling topped with sugar frosting. Very delicious!